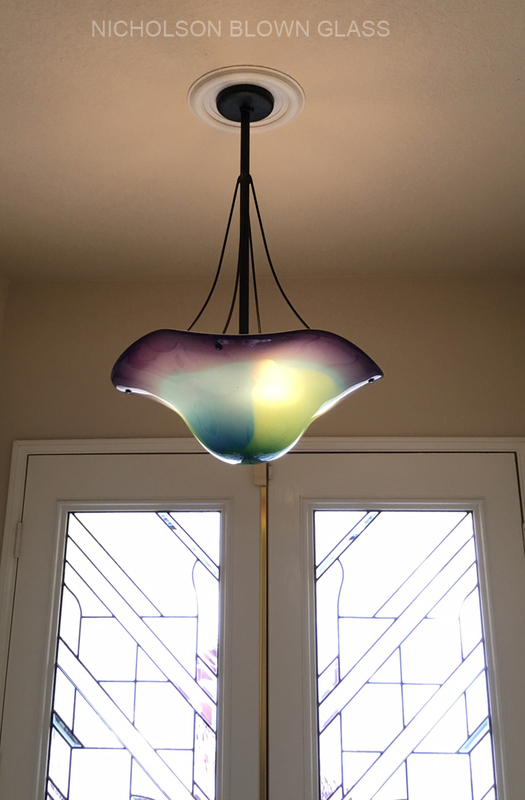 A new Clarity Chandelier made it all the way to installation in La Quinta California. The clients had to be so patient with Rick's recovery from surgery but it was worth the wait. From approving samples, to blowing, to polishing and drilling, to metal and wiring - the process goes through many steps. We love to take on new challenges! As glass artists, Rick and Janet Nicholson are primarily drawn to the flow of color and the emotions they evoke. 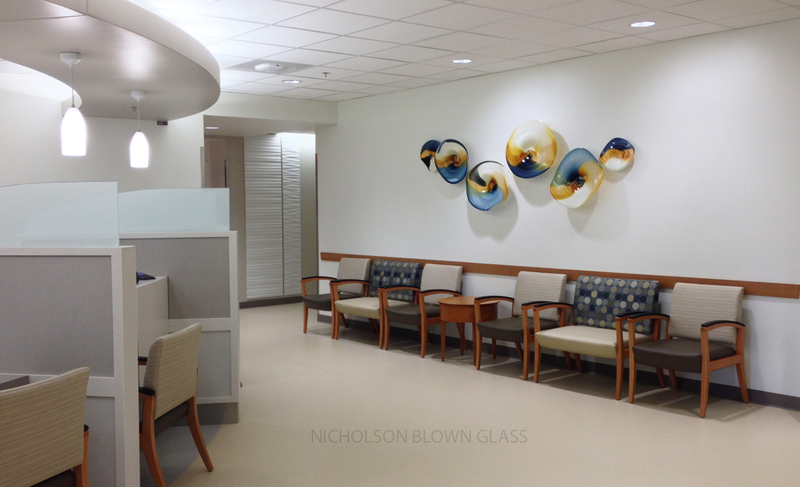 From cooling and serene blends to exciting pops of color, the Nicholson’s blown glass offers unique landscapes pulsing in vibrancy and variety. Viewers may find themselves swept up into an array of energetic blues straight from the Hawaiian beaches of Rick’s childhood or drawn to the calming golden wheat and deep greens of their own beloved foothills. 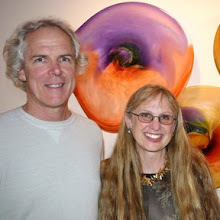 Exploring color through glass is a continually inspiring journey that Rick and Janet enjoy sharing with their viewers. “Serenity at Dusk” invokes the calming effect of viewing the setting sun in the early evening from your own front porch. "I had the pleasure of being there today as our installer, David White carefully installed your fabulous glass in this atrium area of patient waiting. David was so impressed with your attention to detail in including very good install instructions and hardware to make it happen and even painted hardware to match! Your mounting board was perfect. David will add wire just to insure safety. Thanks for that tip. He did a perfect job with no hitches! Linda and I were so impressed with packing, labeling, picture diagrams and the more labeling! You are terrific artists and your method of shipping and install instructions are wonderful! You get a high 5 from Memphis team!! Jimpsie Ayers is a most wonderful artist. You nailed the colors in her beautiful cloud paintings. Please come visit your work! Memphis is a great place to visit and a growing healthcare center. West Cancer Center is on the map for research and treatment. Of course we would love you to see our Le Bonheur Children’s Hospital art. It is one of the best in the country. We are all about art and healing in Memphis!! Art heals, soothes and guides....... We just received the finished photo of our Pacheco Pass for an Onocolgy Center. And, while Rick is recovering from neck surgery, it made me think of how much I appreciate the original artwork on the walls of Kaiser Permanente. Especially as I waited for the surgery to be complete and wandered the halls. Hospital halls can be quite a maze filled with a sober atmosphere. Each piece of art made me stop and drew me into the beauty, complexity or simplicity of each one. They took my mind into a different, calm and peaceful place. They also managed to help me remember which floor I was on, where to turn and make my way to the cafeteria, bathroom, exit, waiting room or whatever my destination might have been. We have been making art for health care facilities for years now and I was grateful to appreciate it from the other viewpoint. 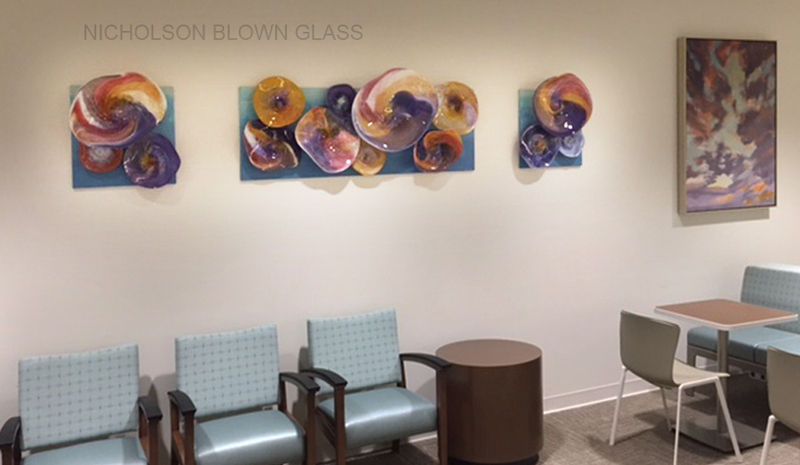 Thank you to Beth Jones of Jay Jay Gallery in Sacramento to include our glass along with other original, local art in a Kaiser facility that we visit occasionally but make an effort to stay away from! Meanwhile, the glass furnace is down and the days are filled with maintenance, metal sculpture and paperwork until mid August. 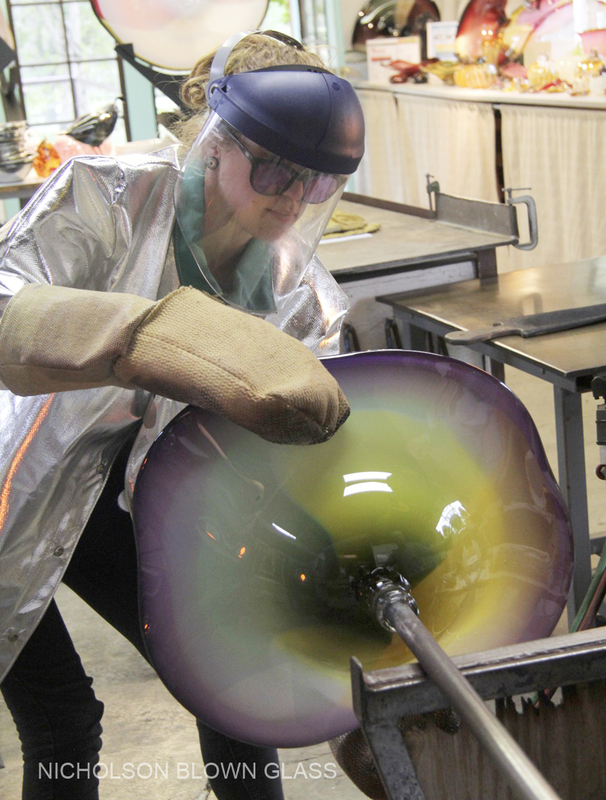 Rick feels stronger each day and we look forward to creating in glass again. However, we are happy to be off during those 100 degree plus days. A summer break from the furnace may become a tradition! Thoughts on life and glass! Enjoy! 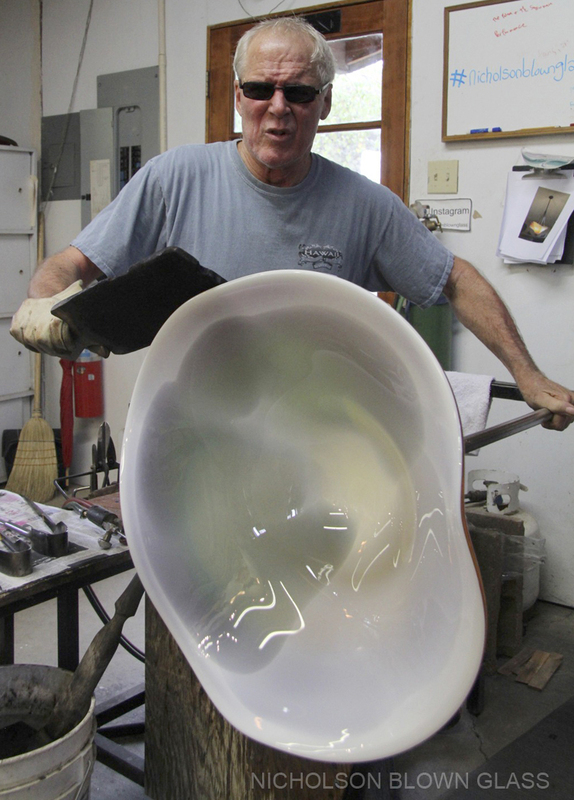 Co-Owner of Nicholson Blown Glass since 1979. Rick studied glass at the University of Southern California and was a TA at Pilchuck Glass School for Dale Chihuly and Fritz Dreisbach in 1981. I left my photographer position at the USC in 1979 to freelance and create designs on Rick’s clay forms. We were married the same year, and our artistic collaboration began. 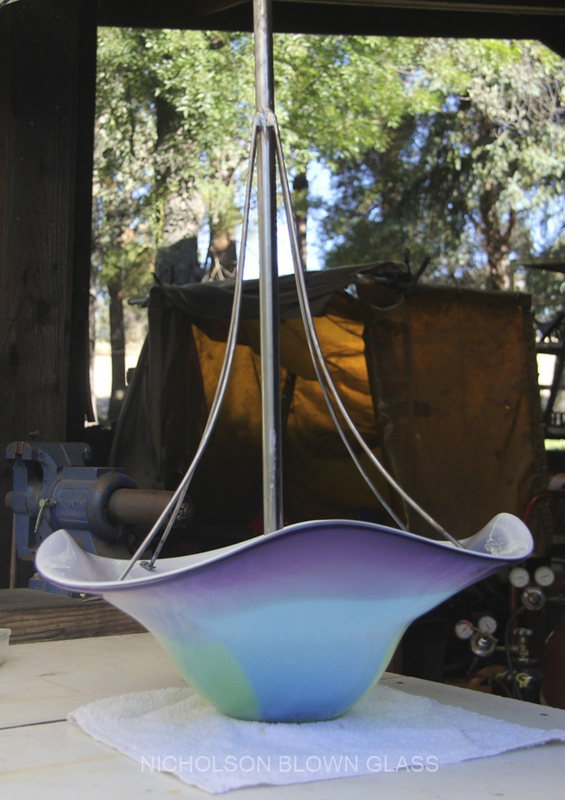 By 1982, we concentrated on glassblowing and moved to nine acres in Auburn, California where we raised two daughters, now in college. Our works involve figurative sculpture, sculptural lighting, and multiple piece wall and ceiling installations. Recent projects include a 10-piece wall for the BMI lobby in New York City; two wall installations for the Ritz Carlton Hotel in Shenzhen, China; a 21-piece wall installation for the lobby of Weil, Gotschal and Manges International Law Firm in Dallas, Texas; a 17- piece wall installation for Kaiser Hospital in Roseville, California; multiple glass and steel sculptures for M Resort in Henderson, NV and two Torsos for the 4 Points Hotel in Guangzhou, China. 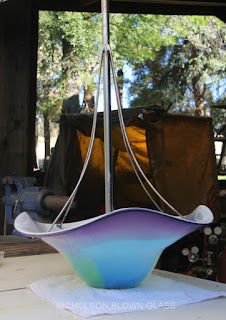 While Rick does the hand blown work, I am the color and design part of our collaboration.